This summer, get ready to dive into a jumbo Boeing 747! Bahrain is planning to sink a decommissioned 70-metre airplane as part of an expansive underwater theme park off its shores. The best part is that it is all eco-friendly! As part of its efforts to boost tourism to Bahrain, this unique underwater playground was created to attract avid divers. It will also feature a model of a traditional Bahraini pearl merchant’s house, artificial coral reefs and other sculptures made from eco-friendly materials. The tourism board hopes that it can also potentially become a site for marine ecology and biology research. After completion, this unique 25-acre diving site will be the largest eco-friendly underwater theme park. Some environmentalists are also expressing concern about the disruption of the local ecosystem due to the reaction of heavy metal in seawater. The alarming issue of corrosion was also brought up as it could potentially be a safety threat to both the divers and marine life. However, a spokesperson of the tourism board assured that all post-production coatings, oil, and grime will be removed by a high-pressure wash with bio-friendly detergents. 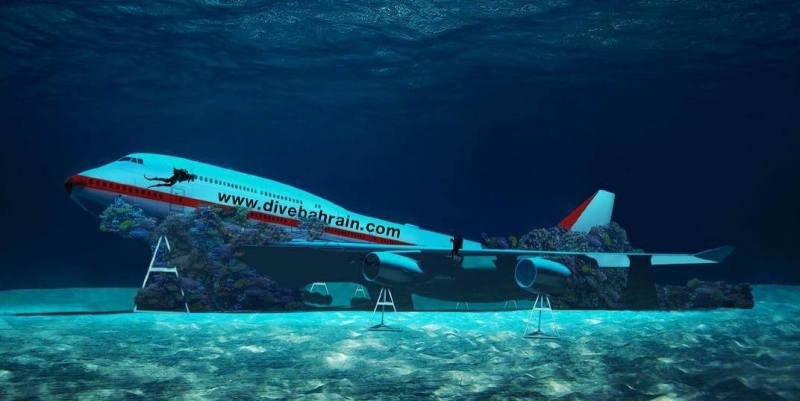 Bahrain is not the first country to submerge a plane for an underwater destination. In 2016, Turkey sunk an Airbus A300 plane in the coast of the Aegean Sea in part of efforts to create an artificial reef. This underwater theme park follows the trend of attractions found beneath the surface like Maldives’ underwater hotel.